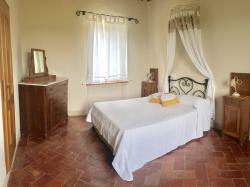 Charming double rooms with aromas of lavender and rosemary. All our rooms are furnished with care to detail, with fresh white linen. Modern private bathrooms with showers, and fresh towels everyday. We provide daily cleaning service. At your disposal, we are here to make you tea and coffee complimentary, all day everyday. We can offer you the choice of two single beds, or a double, and it's possible to request an extra bed. 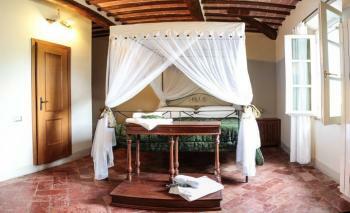 Free wi-fi throughout, mosquito nets, and pool towels on request. Il Granaio is a fully self contained, spacious apartment, with a separate double bedroom, and amazing views of the tuscan hillsides from every window. Walk up the 13th century stairs, and you will be welcomed into your own private haven. Creatively and tastefully decorated, the ambience of this beautiful place will remain with you, long after your vacation has finished. Enjoy the large living and dining area, and if you wish, you can self cater with the inclusions of the gas cook-top, fridge, and all your kitchen appliances. In the mornings, throw open the shutters, smell the fresh coffee beans being grounded, and witness the stunning Tuscan sunrise.